Chittaranjan Park Kali Mandir is located in South Delhi area of New Delhi. The temple is located on a small hill and it was built in 1973 as a Shiv Temple. Shrines of goddess Kali, Radha Krishna and Shiva added in 1984. Chittaranjan Park is famous for the Bengali community cultural center. C R Park is one of the best place to attend Durga Puja and first Durga Puja was hosted in the Temple complex in 1977. Kali Temple is maintained by Chittaranjan Park Kali Mandir Society. The temple is very clean, peaceful and nice to visit. It is spread in huge area and well maintained by the society. In normal days, it remains less crowded. It remains very active during the 5 Day Durga Puja (in Navratri) festival periods and the atmosphere is very good and electrifying. 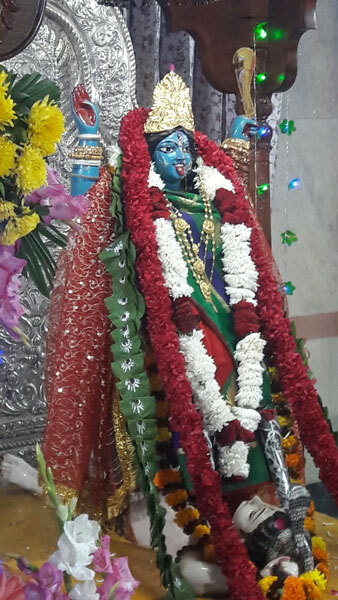 During Kali Puja many devotees pay a visit to goddess Kali. Kali Mandir opening time is 4.45 AM in the morning during summer and in winters it opens at 5.45 AM. 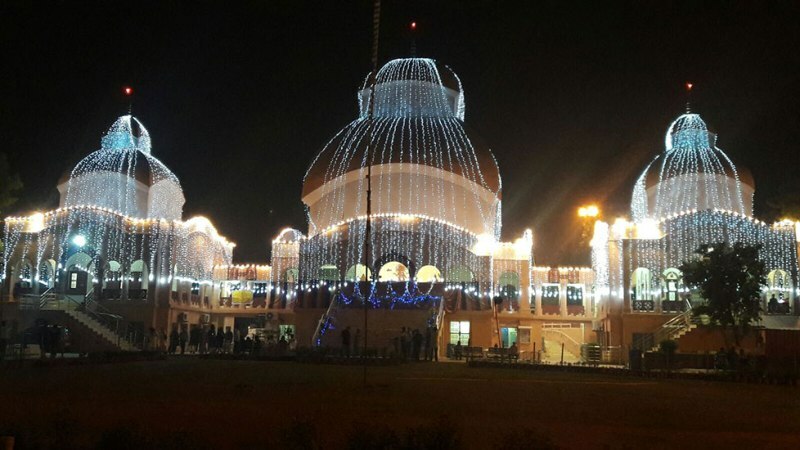 Temple closing time is 10 PM in summers and 9 PM in winters. The temple remains closed at afternoon time. Check the table for more details. Mangal Arati 4:45 a.m to 5:15 a.m 5:45 a.m to 6:15 a.m.
Puja 08:00 a.m. 08:30 a.m.
Bhogarati 11:20 a.m to 11:50 a.m. 11:20 a.m to 11:50 a.m.
Sandhyarati 06:30 p.m. to 07:30 p.m. 06:00 p.m. – 07:00 p.m.
Nehru place metro station is the nearest metro station of the Delhi Metro. It is just 2.5 KM way from the temple. The nearest bus stand is the South Park Apartment and a temple is located just 500 meters from bus stand. The nearest bus terminal is Nehru Place. Devotees can also reach here via own vehicles, however, during Durga Puja festival visitors might get stuck in a heavy traffic jam. Temple complex also have A Dharamshala, tirthashram, library, homeopathy and naturopathy yoga centers. Charitable Dharmashala (Yatri Niwas) is managed by the society. Yatri Niwas has 30 double bedded rooms with all basic amenities for a comfortable stay. Dharamshala has a canteen where vegetarian and non vegetarian food is available at nominal rates. Dharamshala can be booked in two months in Advance and maximum duration of stay cannot be more than 7 days. For bookings contact on 011-26272924 or info@kalimandircrpark.org. Shoe store, Drinking water, Satsang Hall, Pooja Samgri and Prasad shops are located here. Children Park, Garden and clean wash rooms are also present in the complex. Photography is allowed inside the complex and prior permission is required to click the pictures inside the temples. Make a visit to the Kalkaji Temple located just 3 KM away from here. Also visit Iskcon Temple, and Lotus Temple in the vicinity.